The system is built upon an universally recognised standard used to rank services and products. It can therefore be easily understood by a non-technical audience that is not necessarily equipped to decipher the meaning behind the proliferation of green certifications and labels that exist today. 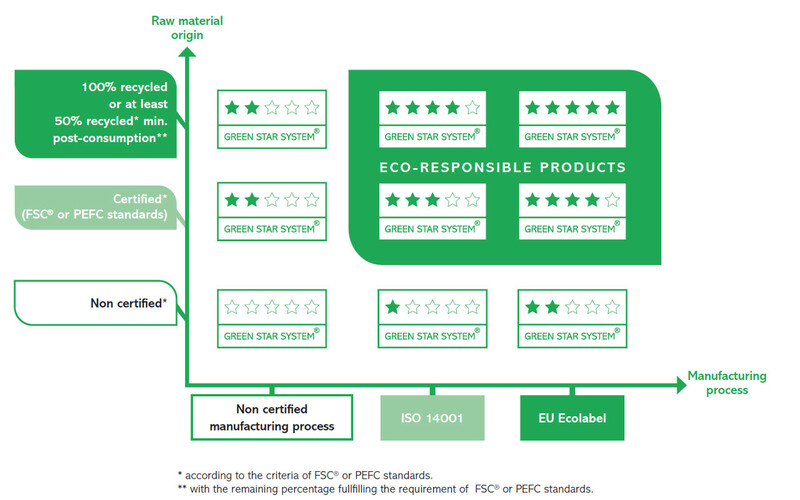 The Green Star System™ incorporates the vital information on the origin of the fibre and the manufacturing process and attributes each paper product a star rating from zero to five based on environmental performance. The Green Star System™ reflects the complexity of what it means to be an eco-responsible product which speaks to a technical audience, but simplifies the information in a rating system that can be understood by all audiences. As such, this self-explanatory system can be easily used by companies to select papers and to communicate about their environmental efforts with various stakeholders without any potential misunderstanding. Click here to discover the Green White paper.